Oh what a weekend! I don’t know about elsewhere in the country or around the world, but we got perfect fall knitting weather. I mean perfect! It rained almost all of Sunday, and was just pleasantly cool on Saturday. I don’t know if we even barely reached the 80s (at least, that’s what it felt like). I loved it. I finished the purple socks on Saturday while waiting for my little brother’s robotics event to end. I didn’t get second-sock syndrome, which I had feared. The project seemed to just fly by. I think it’s because I was doing something different each row. There were no knit “rest” rows in the lace pattern. It kept things interesting. Once the socks are blocked, I’ll post more about them. So, what did I do? Pick an easier pattern? Alas, no. Gee, this gray yarn would look great all cabled. That’s the thought that popped into my head. I have a cable-phobia, so why this idea occurred is beyond me. The only cables I’ve successfully done are those very basic ones were you swap 5×5 or 3×3. Those are easy. I decided to opt for more of a challenge. Socks are good for that kind of small practice, at least, and it’s high time I abandon another phobia. After all, I was nervous to knit in the round. 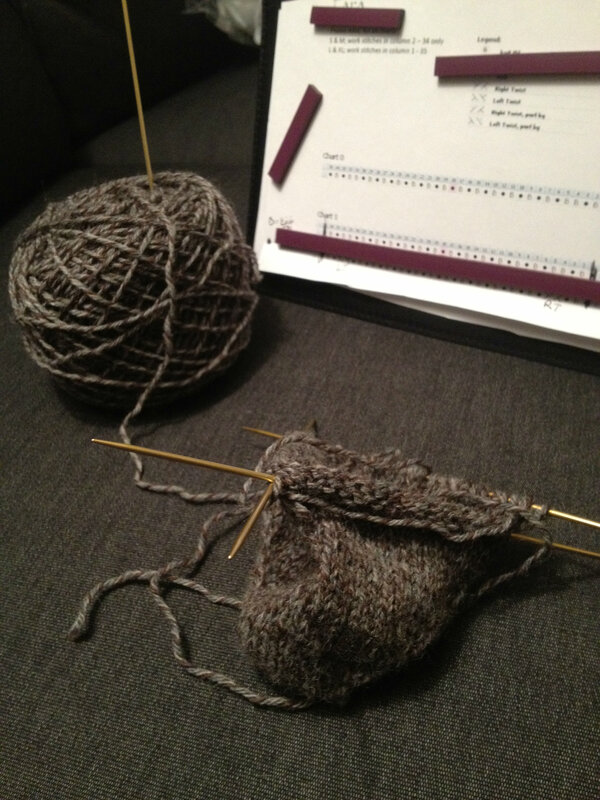 I chose the Tara – SKA March 2012 Mystery Sock pattern by Janneke Maat. I really like the simple look of the pattern, even though the chart made me go cross-eyed. As I’ll be learning a few new techniques, like twists, I’m going to take this project a lot more slowly than I did the purple socks. I really like the way cabling looks, especially complicated twists and braids, so I’m looking forward to this practice. Plus, I’ve always loved cabled socks. It’ll be nice to make them for myself. This whole week looks like knitting weather, so I’ll be taking full advantage of it. Maybe add a hat, get back to work on stockings, and even pull out my new niece’s (yes! We found out it’s a niece! I’m so excited!) blanket. Glad you were able to finish the Purple socks, the cabled socks look like they will be a challenge but completely worth it. I took a quick look at the Diamond Rib socks and it seems to me the parenthesis are used to signal the other sizes of the pattern. (Since there are three sizes listed.) The comma within the parenthesis apparently seems to separate the two additional sizes, which I found confusing, but if you were to print off the pattern and just circle your size it might make it easier. Hope that helps. I have done that so many times, no worries. Glad to have helped.